Marrickville is an old suburb of Sydney and has narrow streets, particularly some running in a north-south direction, that are hardly adequate to function as the major thoroughfares they have become. Illawarra Road is like this. It’s a busy route linking the north side of the suburb to the Cooks River on the south side, and yet there are places where motorists travelling in opposite directions baulk at passing each other because of the tight space between the rows of parked cars on either side. 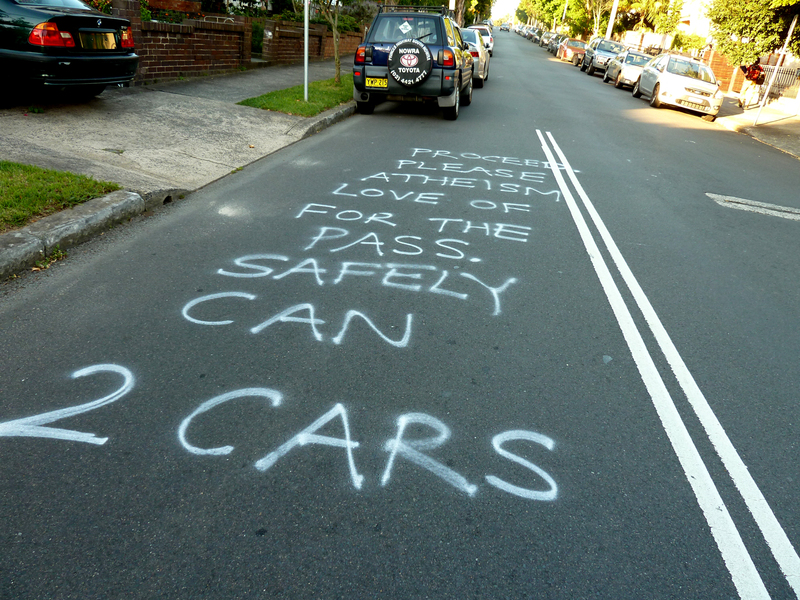 Someone has taken matters into their own hands on one stretch of Illawarra Road. 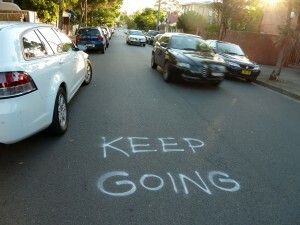 If you are driving south there is a sign painted on the road that reads ‘Keep going’. If you are travelling north there is a longer sign that assures you that ‘2 cars can safely pass … please proceed’. 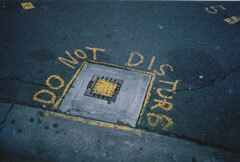 I am interested in what is really going on when people write their own rules and regulations on the pavement. In this case we can probably speculate that the person who painted these advisory notices is either a local resident who sees and hears cars stopping and starting outside their house all day, or a person who frequently uses this route and is often held up by timid drivers. What may to some extent may be an altruistic gesture, meant to assist motorists in negotiating this tricky bit of road, must also involve a large component of self interest. Illawarra Road, Marrickville, near Sydenham Road. He he. You are quite right. I’m glad you noticed this!